First, let me congratulate all the teams that made it to the WCHA tournament this year, from top to bottom. As for Ferris & Anchorage: Better luck next year. The Beavers from Bemidji has certainly had some interesting series this year: Starting the year at #13 North Dakota and taking the first game of the series, to splitting with Northern Michigan to start a 4-game streak, sweeping Anchorage in the process and taking one against Merrimack. Then: A four game losing skid, starting with Merrimack, heading into a series against #2 St. Cloud State, before splitting with #3 Minnesota State. After this start, we would see them splitting most series. Going into the post season, they are led in scoring by senior defenseman & co-captain Justin Baudry, with 8-22-30pts. Following him are two forwards: sophomore Charlie Combs (11-10-21) and junior Adam Brady (8-13-21). In addition to Combs, Aaron Miller and Owen Sillinger round out the top 3 goal scorers. Their goaltending situation is similar to that of the Lakers: Zach Driscoll has been the go-to, with the freshman netminder playing in 25 games & posting a 10-9-4 record with a 2.296 GAA and a .910 Save %. Henry Johnson, a sophomore, has played 14 games, with an overall record of 5-5-2, with a 1.96 GAA and a .916 Save %. Jack Burgart has a single start & posted a loss in that contest. These two teams have met once before this season, on January 25th & 26th, with the Beavers losing Friday night before winning 5-3 Saturday. Well, Laker fans, what a turnaround this series has been, eh? The fans at the Taffy Abel Arena were able to thank the outgoing seniors and wish them off, in what would be their final regular season game…and for the first time in a long time, not their final home game of the year. 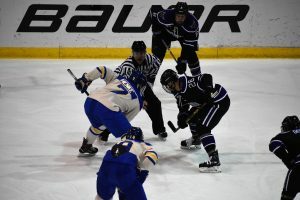 The Lakers would go to split the weekend, and Senior Night was ruined with the loss Saturday. Your top scorers and goal-getters are of no surprise: They’ve been the ones we’ve been talking about all season. Co-Captain Diego Cuglietta leads the pack with 23-14-37pts and is currently only 4 points off the century mark. Following him is fellow Senior & Assistant Captain Anthony Nellis, with 14-17-31pts and Max Humitz with 14-16-30pts. Everyone wants to see Diego hit that mark, but I hope the team does not try to feed him this weekend: winning is much more important than an individual record. Kossoff, again, owns the net. Playing in 23 contests, the senior netminder has a 15-6-2 record, with a 2.53 GAA and a .913 Save %. Sophomore Mareks Mittens did not play last weekend, so his 11 games & 6-5-0 record and 2.31 GAA and .919 Save % remain unchanged. The Lakers will have to play much better than they did the last time they saw Bemidji, and better than we saw for most of Saturday night’s game last week. They also cannot take any stupid penalties; the Beavers are too good of a team to give them any help. Note: The winner of this series will go on to face the winner of the Minnesota State-Alabama-Huntsville series. Win or lose this weekend, we as fans should be proud of the team, it’s been full of fun little tidbits & records: with 23 goals, Diego has the most goals of any Laker since Joe Blaznek & Jason Sessa had 22 back in 1996-1997 season. Only one player since has even reached 20: Domenic Monardo. Staying with Diego, he is tied for first in most goals in NCAA with Arizona State’s Johnny Walker, & finally he is a Hobey Baker nominee. For the first time in program history, the Lakers took home a Great Lakes Invitational win. They have been ranked every week since January 7th. The puck drops at 7:07pm Friday and Saturday nights. If a third game is needed, it will be played at 4:07pm Sunday. Tickets are now available at the box office or online. If you are in the area, or can make to the arena, I implore you to, our boys will need all that energy. If you cannot make it, or are too far away, turn your dials to 99.5 YESfm, or online at yesfm.net, or use the Tunein App to listen to the game. Or you can watch the game online for a fee using FloHockey.tv, which is the official source to view every WCHA game. I think if you asked any Laker or Husky fan this time last season, who would be ranked higher in the pairwise, or USCHO polls, I don’t think many would’ve answered the Lakers. Yet here we are: with three weeks left to go in the season, the Lakers are ranked #19 in both the USCHO and Pairwise rankings, whereas Michigan Tech sits unranked in the poll, and #42 in the Pairwise. That’s not to say that Michigan Tech is a bad team. In fact, they’ve played against a number of ranked opponents, and split against #14 Wisconsin & #10 Bowling Green. Senior Jake Lucchini continues to be a driving force for the Huskies, scoring 7 goals, 15 assists for 22 points. Behind him are Sophomore defenseman Seamus Donohue with 1 goal, 16 assists & 17 points and Brian Halonen, freshman, with 9 goals, 7 assists and 16 points. They’ve certainly spread some love around the net this season. Junior Matt Jurusik has 15 games under his belt this year, going 7-5-2, whereas sophomore Robbie Beydoun has played in 12 contests and going 4-6-1. Devin Kero, the senior statesman, has only played in 6 games, going 1-3-1. It was Robbie Beydoun who was in net the only time these two teams have faced each other this season: in the GLI championship game where he allowed 4 goals (a fifth came with an empty net). to Nick Kossoff’s 3. My belief is that they will split the net again this weekend, unless whomever starts Friday just knocks it out of the park. My gut is also telling me that we will be seeing Beydoun Friday night for two reasons: 1) He’s already played against this Laker team this season and 2) To give him some redemption. Well…this season has certainly been interesting. Sure, I was hoping the Lakers were going to have a good season, but there were a lot of question marks concerning some of the incoming players & the kind of impact they were going to have on the team. For those who’ve had any amount of ice time, their impact has.been.felt. That’s not even taking into account the returning players who’ve really came out swinging. At this point, I would love to wax poetic, but I think I’ll save that for the post-season coverage. The focus this weekend are the Michigan Tech Huskies. Since realignment Michigan Tech has had the Laker’s number, and their more outspoken fans will do everything to make sure you know that. But this season feels like a turning point in the rivalry, what with winning the Great Lakes Invitational. This preview wouldn’t be as positive if it wasn’t for the hard work of these players. LSSU has three point-a-game players: In seniors & Hobey Baker candidates Diego Cuglietta (18-13-31 in 28 GP) and Anthony Nellis (14-15-29 in 28GP) and Junior Max Humitz (12-15-27 in 26GP). Nick Kossoff has owned the Laker’s net for most of the season, having gone 13-4-2 in 19 games played. Mareks Mitens has appeared In 9 games, having gone 5-4-0 and Roman Bengert was put in for part of a period to give him a little bit of time in net, but has gone down with a 0-0-0 record. The Lakers will have to find a way to win not only Friday night, but also Saturday night, which they have not done at home this season, if they want to gain some ground in the Pairwise. Of course, they’ll need the teams surrounding them to lose, but in order to get into the top 16 our boys in blue are going to have to play lights out hockey over these last three weeks of the regular season. 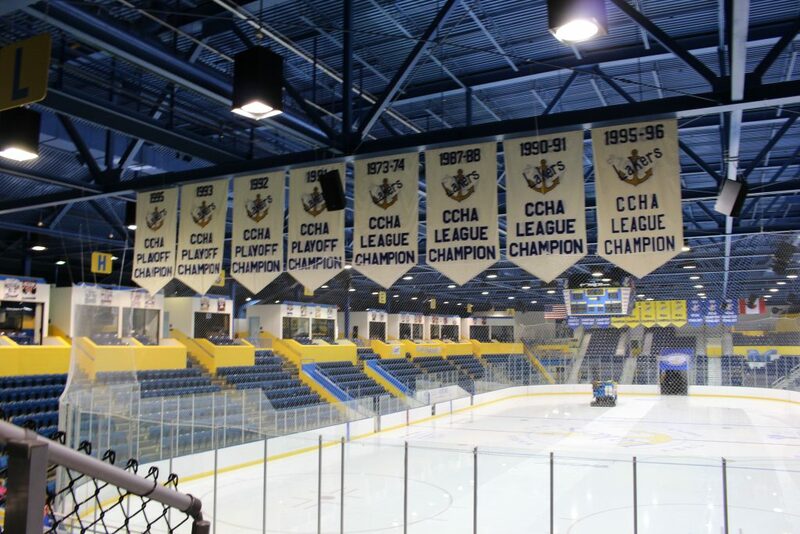 The puck drops both nights ay 7:07pm at the Taffy Able Arena here in Sault Sainte Marie. The game can be heard locally on 99.5 YESFm, or for those not in the area, Bill Crawford will have the play by play on the YESFM stream, or on the TuneIn app. If you care to watch the game, but not in the arena, it will be shown on FloHockey for a fee. Saturday is also Check.Slash.Survive, the rebranded Pink in the Rink, so please stop by the arena and help support that initiative, even if you are unable to attend the game. So, normally in this spot we’d be talking about who the Lakers are playing this weekend, and look at the matchup, but this week we have an exhibition series against NIppising University, which will likely be more about line combinations than anything else. Instead, there is a more important match being made this weekend, and that’s the wedding of two of my best friends, Brittany Litchard and Mike Barrett. 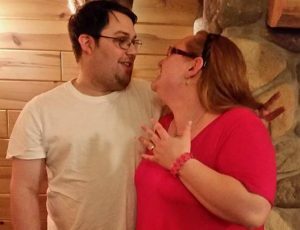 It’s been six long years since they’ve started dating, and after about a year of being engaged, they will finally be tying the knot. But how did we get to this point? Mike & Brittany started dating in the waning days of the summer of 2012. I had known Brittany for about a year, as she had previously dated one of my roommates in college. My only impression of Mike at the time was based off of what Brittany had told me about him, which painted him in a much different light than how he was. Having moved back to the Sault at the tail end of that year, after graduating in April, I’ve been lucky enough to witness their relationship grow. They’ve been through some trying times together and have come out on top. It’s certainly a cliché to say that a couple is perfect for each other, but for these two, it seems to hold true. A weakness of one is the strength of another, and because of that both have grown in ways that nobody could’ve expected having seen them together in their early days. Saturday will mark their 2243rd day as a couple. Surrounded by a slew of family and friends, they will tie the knot near the Straits of Mackinac, which fittingly joins two of the Great Lakes, Michigan and Huron. It’ll mark the end of one six year journey and the start of the rest of their lives. From me, personally, I just want to thank Mike and Brittany for allowing me to be a part of their special day & a part of their lives. Congratulations. The Bemidji State Beavers are currently holding down the final home playoff spot, coming into the weekend at #4 in the WCHA. The lead Michigan Tech by 5 points and trail Minnesota State by 6. Tech is playing #14 Bowling Green this weekend, so it’s unlikely that the Beavers will lose out on their spot this weekend. The Beavers are led by 4 20+ point scorers in Kyle Bauman, Gerry Fitzgerald, Jay Dickman and Adam Brady, all of them forwards. In net, Michael Bitzer has only missed a total of 78 minutes this season. In those 1623 minutes in net, he has recoreded a 14-7-6 record, a 2.14 GAA and a .911 Save %. Interestingly enough, he also has an assist this season. While it’s unlikely that the Beavers move at all in the rankings this week (Minnesota State is playing UAA), they will be looking to win to keep pace with the Mavericks. The last time these two teams met, Lake State was shutout in game 1 and lost 6-3 in game 2. 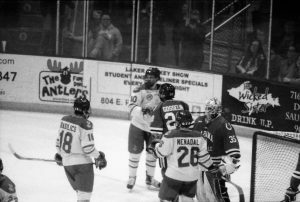 Despite the results, the last three weekends, starting with the Ferris State series, the Lakers seemed to have regained some control and come together to play as a team, save for a few players and a period or two. Saturday night’s game against Ferris gave the Lakers their first conference win in over a month. In the series at Northern Michigan, the Lakers gave the Wildcats a run for their money both nights, losing 3-2 in both games & losing the Cappo Cup. Last weekend was the most promising of all. The boys in blue did lose Friday night 5-3, mostly due to shaky goaltending to start the game. 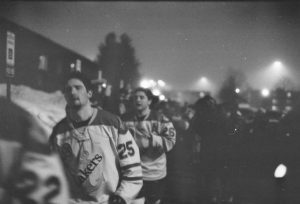 But on Saturday night, the Lakers took it to the then #15 Bowling Green Falcons, losing only 3-2, though by all accounts the Refs gave that game away, waving off a goal that should have counted. But we’re not going to dive into the officiating here. Despite the resurgence of the team, it feels too little too late. As it stands, the Lakers are out of the playoff picture right now, being eight points behind Alaska and only three points ahead of last-ranked Alaska Anchorage. 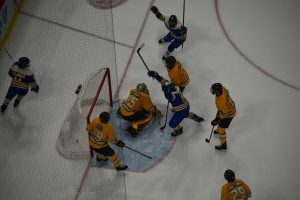 The good news is that the next three weeks will be tough for the Nanooks, taking on Ferris State this weekend, #19 Northern Michigan next week and the Beavers of Bemidji State the weekend of the 15th-16th before finishing up against UAA. The Lakers need to win and win fast. Outside of this, their fate isn’t in their hands – they will need help from the rest of the league to help secure a playoff spot. I’m not holding my breath, mind you, but it could be a very interesting final month of the season. Lake State finally has three 20-point scorers in J.T. Henke, Max Humitz and Diego Cuglietta. Puck drops both Friday and Saturday night games starting at 8:07pm ET or 7:07 CT. They can be heard locally on 99.5 YesFM, online at www.yesfm.net, or on the TuneIn app. For those fans not in the area, or cannot make it to the arena but still want to watch the action, both games will be available on www.WCHA.tv. This week brings the #15 Bowling Green Falcons to the Taffy Abel Arena for a two game set. The team is led in scoring by defenseman Alec Rauhauser (6-22-27), but it’s the senior forward and captain of the Falcons Mitchell McLain (12-8-20) that leads in goals. In net, Bowling Green has seemed to go with a full goalie-tandom. Sophomore Ryan Bednard has appeared in 17 games and holds a 7-4-4 record & has a GAA of 2.23 and a .914 Save %. Freshman eric Dop has appeared in 14 games and holds a very similar record at 7-4-2, with a 2.63 GAA and .899 Save %. Most weeks you hope to face off against the backup in at least one game to try and steal points, but not this weekend – both goalies will be tough opponents. Bowling Green has been riding high since the Great Lakes Invitational, having won that tournament and sweeping two of the three series that has followed since that time, beating both Ferris State in Big Rapids and Alaska Anchorage. They did lose against Northern Michigan, but there aren’t many who haven’t this season. Despite the results, the last two weeks has seen a resurgence of the Lakers in terms of effort and how they look out on the ice, which may bode well for coach Damon Whitten who will be looking for an extension at the end of the season, but the effort seems too little too late. 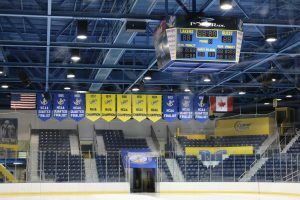 As it stands, the Lakers are currently out of the playoff picture, sitting in at #9 & 7 points being Ferris State, meaning even if they sweep the weekend, and Ferris drops both games against Michigan Tech, we will still be a point out of playoffs going into the final month of the regular season. The decision is largely out of the Lakers hands at this point, as they will need help from the teams above them in addition to winning. 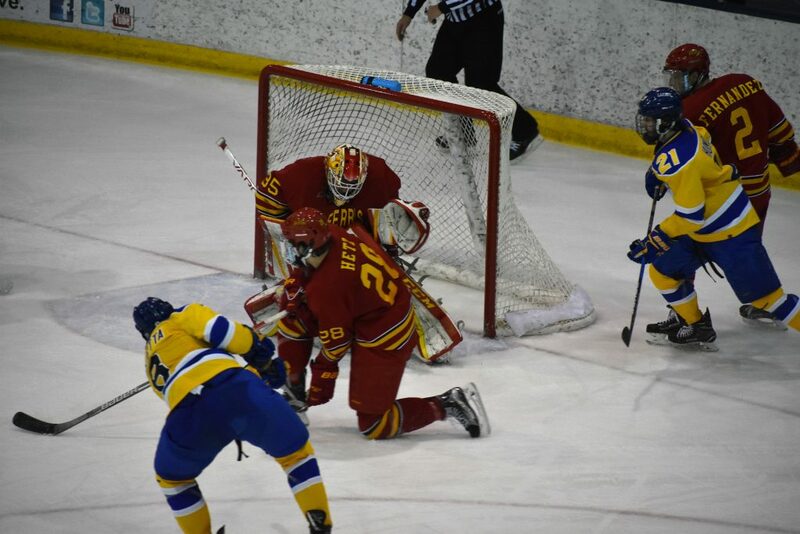 The Lakers are led in scoring by senior J.T Henke (8-16-24) and led in net by junior Nick Kossoff (21GP, 5-10-2), who has a 3.16 GAA and a .907 Save %. This weekend we will have two events happening, both on Saturday: The first is Check.Slash.Survive, which was previously known as Pink in the Rink. It was changed this season so that would help share awareness for more than just breast cancer. Apparel will be sold at the arena, along with a raffle and silent auction for jerseys that will be worn during the game. For more information on this event, please look for their Facebook, Twitter or Instagram pages. The second is the Blueliners annual Senior Night celebration, which will once again be held (sadly) BEFORE Saturday night’s game – between the pre-game warmups and puck drop. This year the club will be recognizing four seniors – the solo forward J.T Henke, and defensemen Kyle Chatam, captain Aiden Wright and assistant captain Ryan Renz. 2017 has been a pretty disappointing year for the Ferris State Bulldogs. Currently they hold the final playoff spot for the WCHA with 19 points, ahead of the Lakers by 7 points. In the 2016-2017 campaign they finished just 2 points out of a home playoff berth. The Bulldogs are led by a trio of upperclassmen in Corey Mackin (6-12-18), Mitch Maloney (12-5-17) and Andrew Doranties (5-10-15) for point scorers. In fact, they are the top three goal scorers, with Maloney & Mackin switching up the order of the list. In this regard, they are much like the Lakers this season, however they have managed to squeak out three more league games this season, putting the final playoff spot out of reach for the Lakers this weekend. The headline says it all here. The Lakers were outscored, outshot and outplayed all weekend in front of a crowd that totaled 893 on Friday and 803 on Saturday. The Lakers did come out swinging on Saturday night, putting up two goals in just over 4 minutes, but the Bemidji State Beavers took control of the game from there. Puck drops both Friday & Saturday at 7:07pm. They can be heard locally on 99.5 YesFM, online at www.yesfm.net, or on the TuneIn app. For those fans not in the area, or cannot make it to the arena but still want to watch the action, both games will be available on www.WCHA.tv. This year’s WCHA standings are a bit of a surprise to everyone, arguably for the Bemidji State Beavers more than any other. The reigning MacNaughton Cup winners, and finishing second in the Broadmoor race started off a bit slow this season, getting above .500 in the two weeks before the Christmas break, sweeping both Alaska Anchorage & Alabama-Huntsville. The Beavers are led by seniors Kyle Bauman and Gerry Fitzgerald as their scoring leaders – both have 20 points going into this weekend. Jay Dickman leads the team in goals, with 11, and also comes in third in overall scoring. 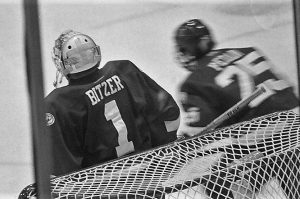 They are backstopped by senior Michael Bitzer, who has played in all but two games for Bemidji, posting a .910 Save % and a 2.26 GAA. If you remember to last season, Bitzer ended the 2016-2017 campaign as the #5 goalie in the nation, posting the most games played, games started & tied for total team games played. He also lead in minutes played, with 1389:26 & won the most games amongst goalies. He was also in a three way tie with total shutouts with 4. He ended the season with a 1.47 GAA and a .938 Save %. BSU will have to have an outstanding second half to allow Bitzer to reach those numbers once again. While I can’t speak for any other Laker fan, I was hoping that the boys in blue would put up a good showing at the Three Rivers Classic, hosted by Robert Morris University & use it as a launching pad for the rest of the season. Sadly, that did not happen. The Lakers opened up the weekend against the hosts Robert Morris University Friday night. To say it was disappointing would be a huge understatement. RMU shutout Lake State 5-0, scoring three goals against Mareks Mitens in the first period, and finishing off with two against Nick Kossoff in the second. The Colonials would outshoot the Lakers in the first alone 17-4, ending the night 38-19. Now while these stats look bad, the tape looks worse. The team left Mitens out there all alone in the first, with a defense even more porous that what we’ve been seeing of late. While the consolation game against the Arizona State Sun Devils would have a different result, they were largely outplayed – Nick Kossoff would stop 48 of 49 goals, however ASU goalie Ryland Pashovitz would only stop 17 of 20 total shots. This team needs a change of heart, otherwise they will end the month, which marks their last home game, with playing in an empty arena and no hope for the playoffs. As of right now, the Lakers are on the outside looking in: two games behind both Alaska and Alabama-Huntsville. If they can get on a run, there is a shot at making the playoffs. But all of that could be for naught if the coaching staff can’t get the locker room back, and from my vantage point, it doesn’t look likely that it will happen, which is a shame as I still maintain that, on paper, this could be the most talented group of players we’ve seen in a while, based off of their previous years with the Lakers, or with their recent Juniors results. January will be the make it or break it month for Lake State: if they cannot start closing the gap, they will miss the playoffs, and I believe that the tone for this month will be set this weekend against Bemidji. Puck drops both Friday & Saturday at 7:07pm. They can be heard locally on 99.5 YesFM, online at www.yesfm.net, or on the TuneIn app. For those fans not in the area, or cannot make it to the arena but still want to watch the action, both games will be available on www.WCHA.tv.